Is D-Mac Angry With The Eagles? This offseason the Philadelphia Eagles have been incredibly agressive, pursuing and landing some of the biggest free agents on the market. Their prize catch — Nnamdi Asmougha. But landing the Pro-Bowl corner was not all the Eagles were able to catch, bringing in Jason Babin, Ronnie Brown, Cullen Jenkins, Vince Young, and then trading for another Pro-Bowl corner in Dominique Rodgers-Cromartie. It seems to be that Philadelphia has taken a ‘win-now’ approach to the upcoming season, and went all-out to insure that there is no more ‘almost,’ for a city craving its first Super Bowl win. Considering that the majority of free agents that the Eagles have managed to ink were offered more money elsewhere, it would only make sense that they want to come to Philadelphia to win that ring. The man behind that charge — Michael Vick. 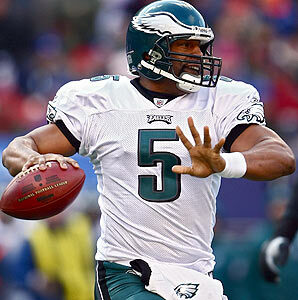 Deep down is McNabb upset that the Eagles had not done this for him while he was the starter? More than likely. Is he upset that the entire time he was the starting quarterback, the Eagles failed to get him a decent receiving threat and a consistent defense? You bet. Is he upset that the Eagles are rolling out the red carpet for Vick after one good season, after he had 10 great seasons? I’d bet the farm. Jon Runyan, Jevon Kearse, Jon Peters, Hugh Douglas were all pre T.O. Instead of free agent $ they were resigning guys like Brian Dawkins, Shawn Andrews, Tre Thomas, Brian Mitchell, etc. to contracts. I thought Donovan gave great effort and appreciated it; will never forget him playing vs. the Cardinals on a broken ankle for half the game.